At a recent reading at the Seattle Public Library, Colson Whitehead said of his new novel, The Underground Railroad: “I wrote this book when I was ready to write it. I wouldn’t have been able to fifteen years ago.” The idea came to him back then, but said he knew he wasn’t good enough to write the story. In a moment when I’m looking at the scraps and beginnings of a second novel, when I’m feeling the pressure of age and mortality, feeling in a hurry to get all these ideas out before I die, it’s good to keep in mind that there is time—and regardless, the work will come out when it’s damn well ready to. And you want it that way. Really. The two must converge: Your skill as a writer and it as an idea. I think of how it would be had I attempted to write The Good Sister in my twenties, when I’d just returned from Mexico and was living in a friend’s basement, trying to adapt to my new/old world while trying to make sense of the experience I’d had. It would’ve been a terrible book along the lines of my angsty journals, if it had been able to cohere at all. Sometimes I scold myself for not having worked harder on my writing in my twenties, that I should have worked through the post-college bewilderment via pounding out a book, putting my writing career in motion much earlier than at say, forty. But I know I couldn’t have completed my first novel sooner than I did. It needed all that time. It needed seventeen years. A moth flitted about in the light, eventually circling down to Whitehead as if to look him directly in the face. He laughed and gently brushed it away. “My spirit animal,” he said. Pieces of a torn up story. Later, I reconstructed it. When he was thirty, artist Richard Kehl said he burned everything he’d ever done. All his artwork—up in flames. Not only was it liberating to burn things, it was the only way to see with “beginner’s eyes”—and we must always see with beginners eyes, he said. As someone who saves just about every draft of everything she writes, this struck me with both horror and seductive intrigue. I wondered what would happen if I burned all my many boxes of papers—drafts of poems, stories and novels, and in some cases, the original works themselves. But I couldn’t imagine ever doing it. What if I lost something vital in there that would never return to me? But, too, what if these kept boxes were keeping me from moving into deeper, richer territory as a writer? In a KUOW interview, novelist Jonathan Evison talked about how he buried his first novel attempts. He wouldn’t disclose burial location or anything about these novels, only indicated that they were really bad and that they needed to be buried, rather than another method of destruction. He found the effect cathartic, clearing the way for his first published novel. Sandra Cisneros, when asked at a reading in Seattle what advice she’d give a beginning writer, said that one should write the truth, write all the things one doesn’t want to write or even think about, then tear the papers up into tiny little pieces—eat them, burn them, or let them float down the river. Tempting as that is, I find myself grateful for those writers who at least kept some of their raw drafts. To see their processes, mistakes, bad lines and titles is comforting. Even those considered our very best have often begun on shaky footing. I remember seeing an exhibition at the National Library in Dublin of W. B. Yeats’s early drafts of poems and feeling heartened by his struggles to find the right word or line. He began by failing. 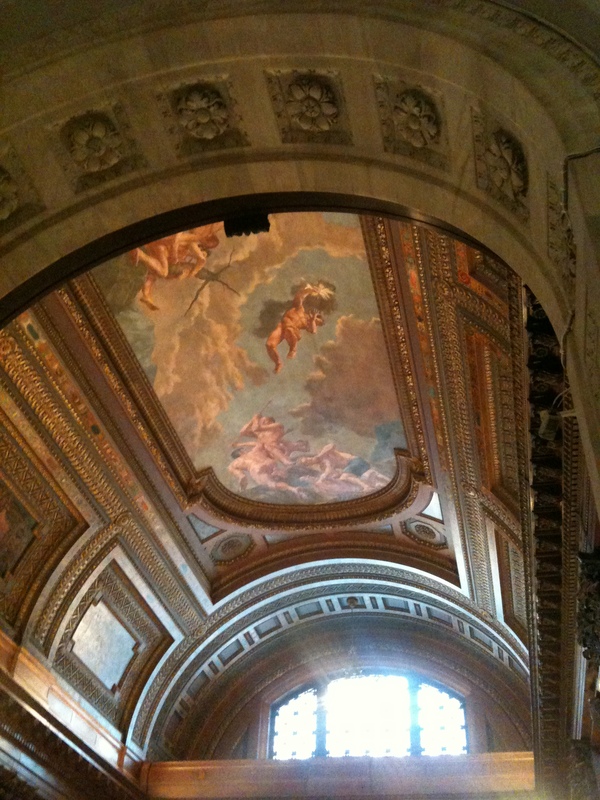 The New York Public Library, Rose Reading Room, place 423: This is where I sat and worked on pieces of my novel (and also to wait out the rainstorm) when I last visited the city. I’m normally not very successful working in public places, and least of all in libraries, but there’s some kind of magic that happens at the Rose Reading Room. Even though I’m surrounded by hundreds of people, I am able to sink in to my own work incredibly well. Maybe it’s the cathedral-like atmosphere, the commanding quiet. The sounds heard in this room are functional: Chairs scraping, someone sneezing, pages turning, the scratching of pens and pencils on paper. Maybe I can sink in because everyone else is—whether reading, writing, studying, or researching, everyone is thinking in a concentrated way. The concentrated brain power changes the atmosphere, creates its own weather. The energy of all of our thoughts collects above us, creating a greater energy than we could on our own. Looking up, the paintings on the ceiling seem to verify this—the bruised clouds tinged with pink and gold are either gathering to storm or clearing to allow for more blue sky. In our numbered places at communal tables, we are each a small Prometheus, bringing our bit of fire to the room—a silent offering. Artist Jenifer Wofford once was given a large space to work in, but she shared that space with her students. This meant anyone could come in at any time, see what she was doing. Jenifer ended up liking doing her work in this atmosphere. “I have a tendency to be lazy,” she said, and having people drift in and out of the room kept her in check. She said she got more work done than she did in a private studio. But more that this, she liked the buzz of the activity of people coming in at any time, unannounced. She liked the discussions that arose around art, the commentary on works-in-progress—that perhaps this combination of elements made her work better than it could’ve been had she been given a private studio to work in. That made me wonder about the way I do my own work, and if my insistence on isolation is really always the way to work all the time. What if I worked in a room with others? How might that interaction with others, or simply the presence of others, affect my work? 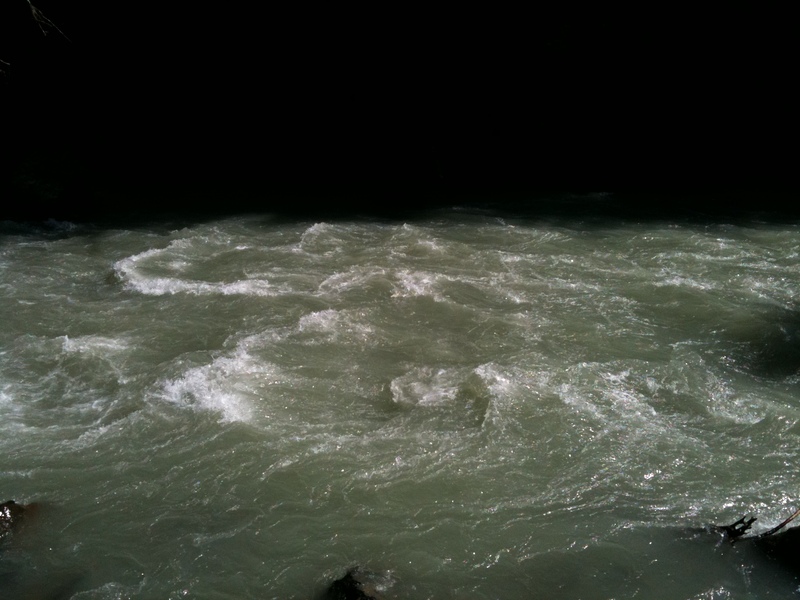 Could others’ thoughts, their sounds, their breathing help shape a poem or a story or give sound to an idea? Would it become something I couldn’t have done in isolation? And finally: Does writing have to be so lonely? Some of my abandoned stories. I usually give up on my work. Most stories I’ve written, there comes a point where the story stumps me and I quit, abandon it. I put all the drafts, notes, diagrams, and drawings into a folder, shut it and put it on the stack of other abandoned stories. Then I move on, hoping the next story works out. For a while, it does work out—writing seems to happen on its own, words know where to go. The writing feels like reading—I’m writing to find out what happens next—which is my favorite place to be. Inevitably, I hit that wall again. 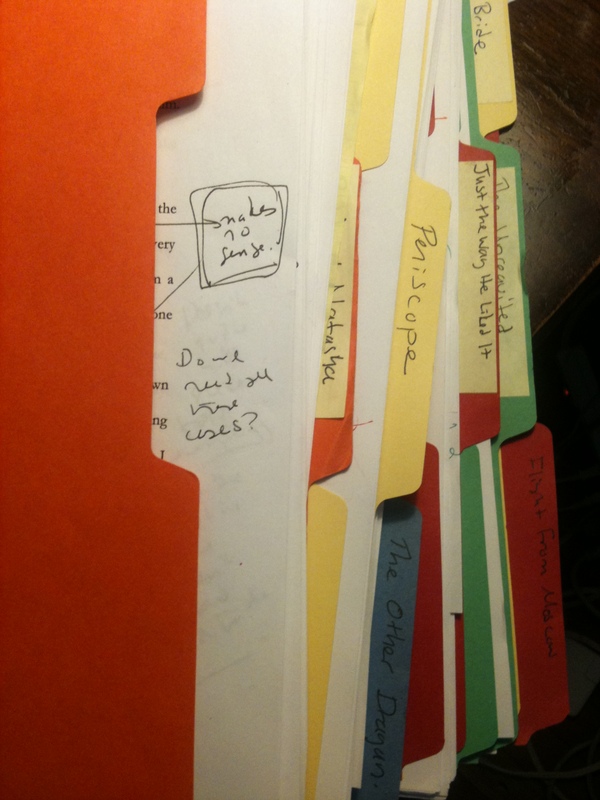 And I look at the file folders of abandoned stories and feel a kind of panic. I begin thinking like someone trying to save her sixth marriage (or so I imagine): No matter what, I’m not leaving this story. I don’t care how awful this story is, I will make it work. And so with that in my head like a mantra, I hammer on, pounding the poor would-be story to death. The thing I forget in those moments is that I usually do go back to those abandoned stories. I go back sometimes weeks later, and sometimes years later. The character’s voice returns to my head, or I find out from either life or from another story what needs to happen, and I return. Sometimes I go back and leave them several times until the stories finally feel right, completed. This doesn’t happen with every abandoned story—just ones that absolutely need to be told. This isn’t a failure. It has taken me years to realize and accept that giving up on a story is the way that I work. It has to happen that way, or else the stories wouldn’t happen at all. The problem is that I’ve kept an image in my head of how writers should write—and therefore an ideal way of how I should work. I first met multi-media artist Jenifer Wofford in Prague when I was at that particular point of defeat. I had returned from an Artist-in-Residence program in South Bohemia to research and finish a draft of a novel, and by the end of the residency, I felt like I’d failed at what I set out to do. I had abandoned the novel, and though I’d moved on to work on other stories, I felt the weight of that failed novel in my gut—as well as literally in my bag. Jenifer helped me drag the monster up all those flights of stairs to my room in the hotel where I was staying, and where she was working. I apologized, as she took one end and I took the other, for the weight of research, books, paper drafts, and whatever else I thought I needed. A few weeks ago, I saw Jenifer again, as she came to Seattle to participate in an excellent group show, War Baby/Love Child, at the Wing Luke Museum. Among many other things, we talked about how we work. I saw myself in her process, how she tends to work on several pieces at once—that is, beginning one, then leaving it, beginning another. She leaves behind a lot of open doors. She said that sometimes when she stops working on a piece and is at work on another, she learns something about the piece she left. Then she can go back to it—and the first piece becomes something that it wouldn’t have been had she not abandoned it first. Her work informs her work, setting off a sort of conversation between pieces of art. For this to happen, it’s essential that the doors be open. Now I think of my file folders as open doors, colorful doors that open into one another, whose inhabitants share secrets with each other—and occasionally with me.